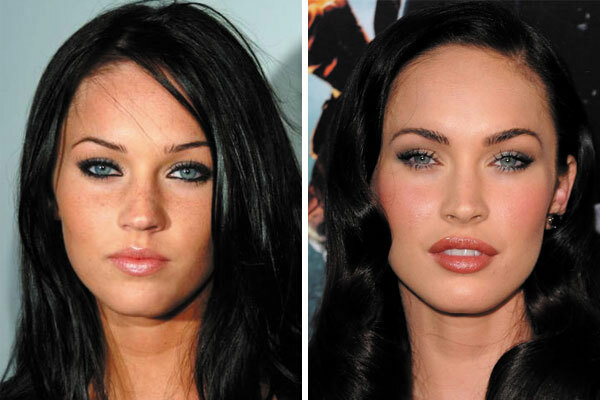 Has Megan Fox had Plastic Surgery? As usual, Megan Fox has all eyes on her. Even more so after her red carpet appearance for the premiere of Jonah Hex in 2010. Megan Fox is one of those stars who has rumors surrounding her with all kinds of plastic surgery procedures. Even though so much speculation surrounds her, Fox’s rep adamantly denies her having had ANY enhancements done at all! After comparing a side by side picture of Megan we would assume she HAS had multiple plastic surgery procedures. Megan has possibly undergone a non surgical brow lift, in which a qualified person will inject a small morsel of Botox underneath the curve of the brow to achieve a high arch. She has also undergone a rhinoplasty to reshape and sharpen her nose. Lip fillers and injections have been made around her lip line to plump them up. It is also speculated she has cheek and breast implants. Megan Fox was a natural beauty who loved the attention she received being compared to Angelina Jolie. Did she transform her looks to more closely resemble the beauty icon? We can only hope she will stop messing with her face before she goes to far…or has she already?